Gotsis has a broad background in arts, design and engineering with a special interest in interactive entertainment applications for health, happiness and rehabilitation. She founded and leads USC's Games for Health Initiative since 2007, connecting health professionals with innovation in various forms of interactive media. She is co-founder and director of the Creative Media & Behavioral Health Center, an organized research unit between the School of Cinematic Arts and the Keck School of Medicine, which was established in 2010. This center designs, develops and evaluates entertainment applications at the intersection of behavioral science, medicine and public health. Her teams have developed interactive experiences and products to help increase literacy and public awareness, change behavior, and improve assessment and treatment techniques with funding from the National Institutes of Health, Robert Wood Johnson Foundation, Palix Foundation, Craig Neilsen Foundation, Department of Education, Department of Defense, Children’s Hospital Los Angeles and the Shafallah Center for Special Needs Children. Her students have created award-winning work that has been showcased at Serious Games, IndieCade, Games for Change, ACM SIGGRAPH and won awards by Unity, Steam, and the USDA. Gotsis is an advisor the USC mHealth Collaboratory, the USC Institute for Integrative Health and the Center for Technology Innovation in Pediatrics. In 2015, the center commercially released The Brain Architecture Game, a tabletop game for teaching the science of early childhood, played by thousands of people around the world. 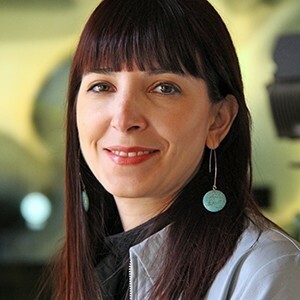 Gotsis has lectured about her research and practice at Apple and Karten Design, presented findings at ACM, IEEE and HCI journals and conferences, as well as medical and public health outlets. She has been an invited think-tank participant at the White House, the Institute For The Future and various NIH/NSF/EU-funded workshops. She has tackled a wide range of knowledge domains and disease topics that include developmental neuroscience, wellness, obesity, nutrition, vision health, exercise, autism, child injury prevention, traumatic brain injury, post-traumatic stress disorder, and upper limb rehabilitation. She and her long-time collaborator Maryalice Jordan-Marsh from the School of Social Work taught the first USC Games for Health course with sponsorship from Humana. Gotsis later developed the first graduate degree in the world focused on Media Arts, Games and Health. Her award-winning students have received recognition in festivals and prizes from the Apps for Healthy Kids challenge sponsored by the Michelle Obama's Let’s Move Initiative, the GE Healthymagination Student Award, Indiecade, Alt.Ctrl.GDC, ACM SIGGRAPH, Serious Games Showcase and Challenge, Unity Unite Awards, Cornell Cup USA, Vilcek Foundation, and the Conference of the Entertainment Software and Cognitive Neurotherapeutics Society. Gotsis has 22 years of experience as a designer and technologist. She privately consults on user experience and interaction design for games and virtual reality. In 2016, she consulted for the Bohemian Rhapsody Experience for Google Cardboard produced by EnosisVR and Google. Formerly the Media Lab Manager for the Interactive Media Division (IMD), Gotsis managed technology infrastructure, oversaw research development and directed several IMD research projects. Prior to being at IMD, she taught art, design, animation and programming courses at the USC Roski School of Fine Arts, Harold Washington College, Columbia College Chicago, and Northeastern Illinois University. She began her career managing a startup internet service provider (ISP) company and providing various creative and technical consulting services for local newspapers moving to digital production. She worked for production companies, such as Quicksilver Associates and Simmonet Marketing to design and develop materials for private companies such as Accenture, Blue Cross/Blue Shield, Young Presidents Organization, government organizations such as the City of Santa Monica and not-for-profits such as the Make-A-Wish Foundation. She provided network engineering support for creative firms, such as Florian Architects, Common Knowledge Communications and Bauhaus and collaborated with educators at Tulane University, Great Northern Way Campus and the National Museum of Mexican Art. She holds a B.F.A. in Photo/Film/Interactive Media and an M.F.A. in Electronic Visualization from the Electronic Visualization Laboratory (EVL) at the University of Illinois at Chicago (UIC) where she was a research assistant on large-scale computing efforts for networked virtual reality (VR) sponsored by the National Science Foundation.